Written by, Evelyn – CCO’s resident herbalist and crazy plant lady. What exactly does it mean when you say you have a tenure on crown land? The best analogy is to compare the transaction to that of leasing a retail space from the property owner. It is important to know that every tenure is different. 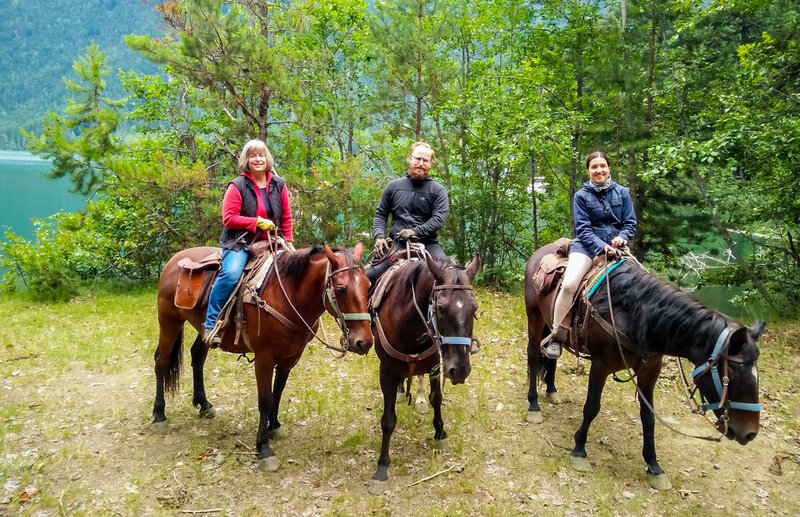 For our tenure, we pay rent and appropriate permit & licensing fees in order to use the land to conduct specific commercial horseback tours in the area. How does CCO decide where to put camps? We don’t. We choose our preferred sites but the final decisions about location and what is allowed are made by the BC government and First Nations. We also look at trail access in order to choose our camp locations. Most of our trails are pre-existing pack horse, trapper, miner trails that we brush and maintain throughout the summer. Avoidance of areas of cultural importance to the First Nations and environmentally sensitive areas are key to both governments as well as ourselves and our neighbours. Our operations and activities are monitored closely by government authorities. What activities do your guests engage in? Discussions about environmental stewardship, the historical and cultural significance of the area to the First Nations, the history and impacts of mining, agriculture and forestry practices, the impacts of climate change, the local flora and fauna, world peace, BC wines…oh, and the ever-important practicalities of relieving yourself in the woods and packing all evidence of it out. We do not guide hunters or excursions to harvest berries, trees or medicinal plants. What is the benefit of a crown land tenure to the area? We provide employment for staff and local contractors. We provide business opportunities for owners of shops, restaurants and accommodation suppliers. We buy locally from bakers, farmers, grocery stores, the hardware store and fuel suppliers. We even buy most of our horses locally. The public does not have to pay for trail maintenance within our tenured area and may use the tenure trails as long as the activity is not for profit. We are “Smokey the Bears” in the woods. As we are out there most days during the summer, more than once we have had to ask unaccompanied tourists to extinguish their illegal campfires. We do not ever violate a campfire ban and we work hard to ensure our guests understand why we must cook their meal on camp stoves when they visit during a fire ban. We have an extensive communication system in an area without cell towers. If Joe Public gets himself into trouble out there, we can probably help. We are not a faceless corporation. This is our home. We live, work and play here along with our families, friends and neighbours. Taking excellent care of our guests and the area are paramount to our existence and are non-negotiable. Part of our tenure is home to two extremely rare plants: Gentiana tenella and Boechera paupercula. We were notified of this when we were granted our tenure and we have led two hiking expeditions of naturalists in search of them. We do not want to disturb them with our guests hiking activities and we want to identify their locations to the scientific community. There are only a few photos on file of these plants taken by hikers in the Tenquille Lake area and it is of utmost importance that their locations be identified and protected.